Everything is back on track for our move to France. We're scheduled to sell our house in early December, live with friends for a few weeks until we finish work, and then head down to Florida for Christmas. From there, we'll fly to Paris. Of course, things could fall through, but I have to be hopeful that things will workout and soon I'll see Paris again. This is the Pont Alexandre III, a bridge over the Seine. We stayed on the bridge until these lamps were lit. Here I am in the Jardins du Luxembourg soaking up the sun. Even the clouds are romantic in Paris. How dramatic. or even Angelina's for some of their famous hot chocolate. And the best thing about our move will be that we won't be rushed. We'll have days and weeks and months to explore France. Thanks for cheering me on as I continue this uphill journey to uproot our lives and settle in France. Anyone who reads my blog knows that running is a huge part of my life. And for about 15 years, I have had some good friends who run regularly with me. One friend moved to Louisville, about an hour and a half away, and the other friends and I started running less and less over the years, only meeting occasionally on the weekends. Toward the end of September, as I finished a run, MapMyRun suggested that I do a "challenge." The challenge was simply to see who ran the most during the month of October. I texted my friends and asked whether they were interested. The initial response was not enthusiastic, but slowly, they came around. I thought our friend in Louisville would never agree to join us. She is very private, and the idea of following each other's runs on MapMyRun put her off. But after a couple of days, she surprised us and joined. All four of us were then on MapMyRun together on the challenge. I loved that we were all together. It felt almost like we were running together again. At the beginning, I apologized. I'm obnoxiously competitive. Najah didn't buy into the competition, just enjoying our running time together. Noreen has also stepped it up, but working early each morning, she doesn't have time to overdo it like I do a couple days each week. Noreen and Najah joined me for a run Sunday morning at my house. None of us had been running a lot. I usually ran 3 or 4 miles on 3 or 4 days a week. That would come out to a maximum of about 64 miles per month, but the idea of competing revved my engines. 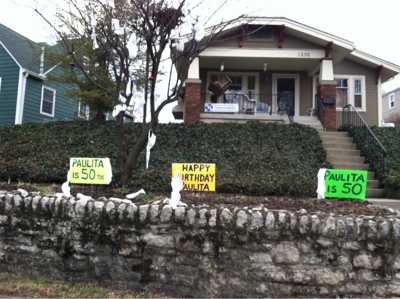 My friend in Louisville doesn't mess around. She runs 8 miles at a pop. Suddenly, I was having to force myself to run 5 or 6 days a week, and my mileage increased. I stayed in the lead for much of the month, but slowly, her runs caught up with me. Lots of short runs could not compete with her 8 milers. On Sunday, my Columbus friends and I ran five miles and felt satisfied, but when we closed out the app, my Louisville friend had run 11 miles. On Tuesday, I ran 10 miles. That had been my New Year's Resolution, to be able to easily run 10 miles again. So by October 24, I reached my resolution. Feeling smug that I'd taken the lead again, I turned off my app. The next day, my Louisville friend ran 11 miles again. Twinges in my knee and ankle are reminding me that my body is not used to all this running. I woke up this morning seeing that I was six miles behind my friend. I decided to run a moderate amount. I couldn't go ten miles again like I had on Tuesday. This railroad trestle crosses the trail, and you can see downtown Columbus through the bridge. I walked with my friend Sheila first, waiting for the weather to warm up a bit. Around 9 a.m., I headed toward the bike trail that runs along the river and to downtown Columbus. I ticked off the miles, deciding at what point I would turn around. Maybe a five-mile run would be enough, although I wouldn't catch my friend. As the hitch in my left knee caught a few times, I thought maybe I should just concede. But I kept going. The trail along the river used to be under construction, but now it is finished all the way to Bicentennial Park, which is where cool water fountains offer relief in the summer. The arched bridge in the background is new to Columbus. I looped around at four miles and headed home, planning to stop at a Starbucks as a reward. The trail crosses the river, offering views of herons and a low-head dam. Should I continue on the trail? Go for nine or maybe 10 miles? No, I circled around the Starbucks to make sure I reached eight miles, before easing into a chair to relieve my sore feet. Grace met me at Starbucks and gave me a ride home in exchange for a coffee, and some always precious conversations. I know that it's my dream to move to France, and I couldn't be more thrilled to be moving, but that doesn't mean I won't miss things about Columbus. And mornings like this are worth appreciating. The LeVeque Tower stands stark against the brilliant blue October sky. Right now, my mileage for the month is at 100.85 miles. I'm currently two miles ahead of my friend on our October challenge on MapMyRun, but I've made peace with not winning. I've promised myself not to overdo it. Resist, resist, I urge myself. Injuries will get me nowhere. The challenge ends on Tuesday, and I vow not to spend the day running until I go to work in the evening. Because, you know what happens on Wednesday, November 1? It's the start of Nanowrimo -- National Novel Writing Month, where I try to write 50,000 words in a month. From extreme running to extreme writing. We had five showings on our house today and received three offers. Officially, we are now in contract and scheduled to close on December 8, plenty of time to spend Christmas in Florida with my parents and to fly to France in the New Year. We are moving to France! We really are! So we have a contract and a backup offer to help things move along. France will happen after all. Thanks for all the support and good wishes. My optimism is on the rise. A toast to our good luck and to all of my friends online. Thanks for your support on this crazy voyage. Was it less than two weeks ago that I joyously made our plane reservations for THE TRIP to France? The trip that would change our lives? The one where we packed all of our belongings in a few bags and moved to start a new life? 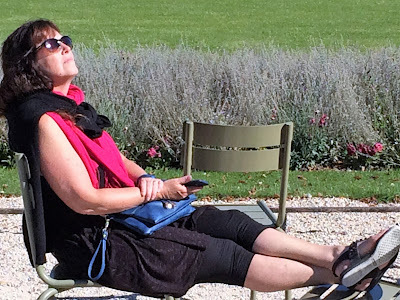 I carefully picked out a 4-star hotel in Paris where we would spend a few nights before journeying into the countryside to begin our first housesitting job. And in the span of a fortnight, those plans have crumbled like so much blue cheese. Our house fell out of contract on Friday because the buyers could not get their financing. We urged the real estate agent to get the house back on the market, even though she had told us before that people plan their weekend house viewing on Thursdays. We were a day behind, but we needed to get out there. I had run six miles that morning, reaching my daily step goal by 8 in the morning, but after work, I never sat down. I came home and headed straight into the backyard to pull dying plants from the dirt and to rip the morning glories from the trellis where they had flourished all summer before beginning to wither. I knew how they felt. I swept walkways and cut back ivy that had grown toward the sidewalk. My steps reached over 30,000 that day as I madly tried to outrace my worries. Would we be able to move to France? What about our appointment in Chicago to meet with the French consulate? Would Earl have to continue working rather than retire so we could pay our mortgage? When he came home, we began to talk of a shorter trip to France where Earl would return home after three weeks while I stayed in France to meet our housesitting commitments. The concerns whirred in my brain as I made a family dinner that night, drowning my sorrows in a few glasses of port and sharing the stories of how we first came to drink "porto" as they call it in France when my friend Delana and her then-boyfriend Patrick recommended it as an aperitif. I loved the sweet tanginess of it. I don't recommend turning to alcohol to drown sorrows, but felt I had definitely earned it with my 30,000 steps and the view of my France dreams in a downward spiral. We'd have to cancel Christmas plans in Florida with my parents if Earl didn't retire. He'd need to work the days between Christmas and New Year. How would Earl get to Florida for our flight? Should we change it? Should we cancel our appointment for a long-stay visa if we weren't going to be able to move? I ran six miles again the next morning before my final Saturday morning class -- or was it? Would I be teaching in Columbus again in 2018 if we didn't move to France? When I returned from class, I found Spencer sitting on the couch holding a heating pad to his ear. A sore throat and blossomed into an ear infection. A notification arrived on my phone. A showing on Sunday at 1 p.m. Ok, 24 hours to get the place shipshape. Then at 2, another notification - approval requested for a 4:15 showing. Spencer thrashed on the couch, fever making his eyes glaze. "Please tell them I'm sick. Just let me sleep?" he begged. I pointed out that he needed to do nothing but stumble over to the neighbors where he could continue to lie on the couch -- she's a good neighbor. Earl and I work feverishly to get the house in showing shape. A second showing that afternoon, at 4:30, flashed onto our phones. Glad we hadn't turned down the earlier appoint, we hung white towels, shook out a white comforter, straightened fresh flowers, and lit a candle in a freshly carved jack o' lantern on the front porch. With a sprinkle of peppermint and rosemary essential oils on the light bulbs, we abandoned the house and crossed our fingers. Two more showings loomed on Sunday. I raced to the garden store and bought some purple and orange pansies. Earl carved two more jack o' lanterns. I mowed the backyard and meticulously staged the house again before we deserted the house for the afternoon. We visited my brother about an hour and a half away, forgetting about our troubles and hoping for the best. Around 7, we returned home, and just minutes ago got an email with an offer on the house. So, this is that part of the novel where the heroine sees the sun rising and realizes she can't give up on her dream. That's me tonight, and by tomorrow, I could be in contract again. Thanks for your well wishes, your good karma, your prayers. Every good novels has twists, turns and setbacks, but this isn't a novel -- it's my life. Nevertheless, we received a setback on Monday when the realtor called to say the VA appraisal did not reach the purchase price of the house. We live in a small house in a community that is suddenly the place everyone in Columbus wants to live. It's a pretty amazing place to live, as I've opined before, with restaurants, coffee shops and little boutiques all within walking distance. The school is small with about 1000 students throughout all 12 grades, and it wins awards each year when the state judges the best school districts. We also avoid using buses because everything is within walking distance. And, it feels a bit like a 1950's community, where women feel safe to walk or run alone even when it's dark, and doors are frequently left unlocked as children roam the neighborhoods after school. 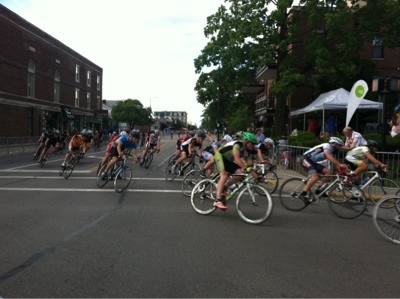 The annual bike race and marathon both run through our town. Our asking price is about $50,000 more than the county auditor's estimate of our house, but the county auditor price usually is less than the appraised value of the house when selling. The people buying our home are using a VA loan because he is a veteran. VA loans are harder to pass. What we didn't know is that the couple, moving from Texas to Ohio, plan to put no money down. That means the loan has to be approved for the entire price of the house. Our real estate agent has until today to convince the appraiser and the bank that it is worth the asking price. "The buyers still want it," she told me on the phone. "They're willing to rent or do a land contract." At first, I pondered that idea. They could put $10,000 down and rent for the year. Then if they couldn't follow through we could put the house back on the market. That's before I found out they planned to put no money down on the house. As a wise man in my house said, "This isn't a Volvo. Why are you expecting to buy with no money down?" If they don't have the $10,000 to put down on the house, then they wouldn't have $10,000 earnest money to give us. That's when I decided to push the issue. I texted the real estate agent and said we'd have the house ready to put back on the market on Thursday, right after the new furnace is installed. (That's another twist for another day). I told her that if the buyers are in love with the house and want to buy it then they are going to need to come up with some money to bridge between the selling price and the appraised price. If they have other property, they can take out an equity loan on that. Or if they have a 401k, they can borrow money from that. Unless they step up, we're back on the market, which means, our house might not be sold and Earl might not be able to retire. We have our plane tickets. We have our room reservations and three housesitting jobs that last through March 15, but I might be traveling alone. Throw some quick good karma or prayers or whatever you believe in our way. I do want to live in France, but I don't want to leave my best friend behind to work, and he's definitely ready to live a retired life. 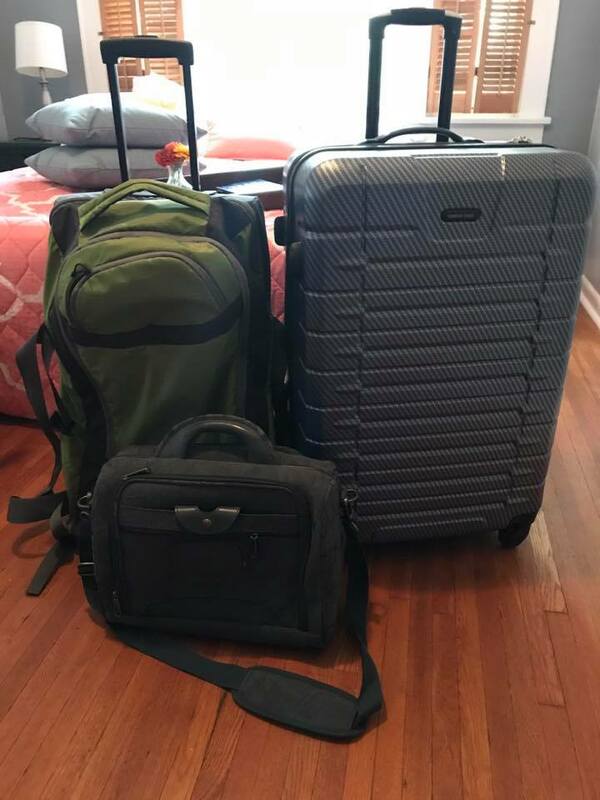 Today on Facebook, I posted a picture of the three suitcases I'll be taking to France. That's all I plan to take to begin my new life. One of my Facebook friends asked why we didn't simply ship boxes overseas. We will have some boxes stored in my brother's basement and another friend's basement, but I've read enough horror stories about shipping items to France that never arrive, that I wasn't even tempted to pay for boxes that I might never see again. Face it, anything that I am keeping, I'm not willing to risk mailing in a questionable system. Another issue about mailing boxes is that we don't have a permanent address yet. Where would I mail them to? Most shipping services don't give upfront prices for mailing overseas, but the one that does would charge $169 for a 66-pound box or suitcase, and it makes no guarantee that anything breakable would arrive in one piece. I've been looking at the China cabinet today trying to decide what we might want to keep. We plan to move the China cabinet to my sister-in-law's house next weekend. She says she'll hold onto it until Grace wants it. The cabinet is full of highly breakable things. Our gold-rimmed China that we received for our wedding has been used so rarely, that I feel no compunction about getting rid of it. Grace has chastised me, but she didn't offer to keep it. So I'll find some place to donate it. I have so many wine glasses and liquor glasses. Many of them are from Mom and Dad's wedding, so I want to keep those, although I'm not sure how I'll ever get them to France. I also have a lovely Laura Ashley tea set I'd like to take along. A friend gave us a Limoges tea (coffee?) set as well for a wedding present that I would love to have in France. But is it silly to take a French tea set back to France? Could I just as easily find ones I like that at an inexpensive price? Once the China cabinet is cleaned out, I have things like quilts that would help me start a new life in France. Mom has made quilts for nearly every occasion, and I hate to be parted from any of them. I may look for some of those compression bags that squeeze down items in hopes of taking a quilt or two along. Other than clothes, toiletries and my computer, I don't anticipate needing a lot. We'll be housesitting so the houses will be outfitted. And when we buy a new house, hopefully it will be furnished. If not, we'll have to furnish it by visiting the local flea markets. I know many people ship boxes of books to France, and I hate to be parted from books I love, but luckily, we live in a world where I can download books onto my phone and read them. I love always having a book with me on my phone. So for now, before I actually begin packing, I think I'll have plenty of room in my three suitcases. We'll see if I still think that three weeks from now as we prepare to begin our vagabond lifestyle. And when people from Ohio come to visit us in France, I fully expect them to pack a wine glass or two to bring along as we slowly fill up our cabinets in France. I am so thankful to have been able to stay in the house well into the autumn. If we had sold the house immediately, we would have been out already, renting a place or living with friends. Instead, we get to enjoy life in our little village within a stone's throw of downtown Columbus and Ohio State University. Because we are so close to downtown, the Columbus Marathon runs through the middle of our town. Most years, my friend Sheila and will go walking along the route before the race begins. She has as many deadlines as I do with her husband having back surgery on the same day we close on our house, so I didn't ask if she wanted to walk. Instead, this morning, I decided to start at our house and run the route backward for about 4 miles. It can be more challenging than you expect to figure out which way the route goes when not all the roads are closed yet. Mostly, I relied on judging whether cars were parked along the road. No cars equals Marathon route. Even so, I got confused several times and started down roads before noticing that no banners waved or port-a-potties stood sentry, so I'd turn around and try a different road. Since I had several false tries, I decided to run 4.5 miles to make sure I reached the total of 8 miles I hoped for. I'm so glad I kept running because I discovered that the marathon is running through a cornfield path. It's weird in a city of nearly a million people to still have a cornfield in the center, but because Ohio State teaches agriculture, there are cows and cornfields within the city. I had just run the path through the cornfield last week while waiting for Earl to finish his physical therapy. In the fog, alone, the path is a bit spooky. But this morning, the sponsor had done a great job making it a highlight of the 26.2 mile race. These "race car" banners showed runners where to turn. Then a banner welcomed runners to the field. Along the way, there were signs with pop culture icons or bad jokes, meant to encourage those reaching the high mileage of the marathon. The marathon is sponsored by Children's Hospital, so many of the miles are dedicated to children receiving treatment. I started taking pictures of the mile markers and the kids, and got to meet two of the children who had already shown up to support the runners. Mile 20 was dedicated to Andrew. He got excited when he saw me and thought the marathoners were already on their way. Then farther down the road, Amelia had already arrived to cheer for the runners on her dedicated mile. I ended up running 9 miles, and I was pretty spent by the end, but I'm so happy that I had the opportunity. Aargh! My life is too crazy. Every week I forget about my Dreaming of France meme until I see that Sim has already posted hers and is waiting for me. I wonder what could be distracting me? This weekend, I started to feel some anxiety as I realized everything that has to be accomplished for us to move to France in about 86 days. So the house is in contract. The final hurdle is Tuesday when the appraiser comes. If that all goes well, we close on the sale of our house in early November, and I have already scheduled our appointment with the French consulate to apply for a long-stay visa. That's all. Nothing much else going on in my brain, except beautiful dreams of how lovely our life will be in France if we can get everything else under control.